There’s a right way and a wrong way—allora! If quantity is quality, I feel uniquely qualified to write about tiramisu: I can assure you that in my time I have eaten my own weight in the famous Italian dessert—and probably yours, too. The perfect tiramisu is a balanced meeting of contrasts. It’s whipped cloudy with eggs, weighted by heavy mascarpone, sweetened with a hint of sugar, perked up and embittered by coffee and cocoa, and mellowed out by liquor. Let us follow his lead and begin. It might seem like a slapdash dish that needs no recipe—but this heavy dessert requires a light touch. It’s important to take heed from Italian sensibilities and use the best ingredients possible and keep it simple—avoid weighing it down with extra touches for extra touches’ sake. Here are the building blocks of an authentic tiramisu. I challenge you not to eat it by the dish-full. The literal building blocks of a tiramisu are Italian ladyfinger biscuits, also known as sponge fingers or ‘savoiardi’ in their homeland. Lightly dusted in sugar, they are very dry and otherwise pretty bland (sorry or not sorry, it’s true). It’s as if they were made with tiramisu in mind as these qualities makes them perfect for soaking up the boozy espresso mixture. Proceed with caution here: Soaking the ladyfingers for too long is one of the most common tiramisu mistakes and will yield a soupy end result. It’s important to work quickly as you glide the ladyfingers through the cooled coffee—the lightest dip on each side is all you need. Linger too long and they will turn to mush as the tiramisu sits but get it right and you’ll have the enviable tiramisu texture that’s somewhere between spongy and moist. It’s up to you how many layers you create—I for one am a good-things-come-in-threes person and enjoy plunging a spoon through the al-dente layer on top down to the more potently soaked base. I always use coffee made in my stovetop Bialetti espresso pot for tiramisu, thinned out with a little cool water and the all-important alcohol (that’s up next). You could also use coffee made in a French press or coffee machine, but I’d steer away from less potent instant coffee—you want strong, high quality coffee for the best flavor. Using the best coffee you have means that the ladyfingers will leach maximum coffee flavor from even the quickest dip. Wait for the mixture to cool before dunking the ladyfingers or they’ll disintegrate more easily. Loose-wristed pouring from the bottle has meant I’ve over-boozed more than one tiramisu—but while I continue to learn my lesson, I recommend following the amount specified in your given recipe for a less-flammable, drive-home-care-free result. The alcohol is where you can have a little fun and experiment each time by using different fortified wines, liquors, or liqueurs. You can of course make the tiramisu without the alcohol and use only the coffee—which, again according to which version of history you believe, is also said to be the ‘original’ way. Fortified wine: The traditionalist’s choice is a sweet fortified wine like Marsala. It’s lower in alcohol content and adds a light, fragrant note. You could also use Vin Santo or Madeira. Liquor: Rum and brandy are the popular choices for boozy desserts, and when it comes to adding depth to tiramisu, it’s no different. Use whichever you have on hand. Liqueur: To take your tiramisu up a notch, use a liqueur like almond-y Amaretto or hazelnut Frangelico to infuse a fourth flavor into your dessert and complement the coffee and chocolate. My personal favorite is Sambuca, an Italian anise-flavored liqueur. Though anise is a bold flavor, here it helps to cut through the richness adding what I can only call a cooling note, rather than overpowering the whole dish. You can also intensify the coffee flavor by using coffee liqueurs like Kahlua. Mascarpone, though considered a cheese, is really the holy grail of cream with both the velvety body and richness to hold up a tiramisu. It’s hard to replicate that level of creaminess or achieve the desired, sliceable consistency with heavy whipping cream alone, so the best approximation would be double cream if you can’t get mascarpone. Eggs are the secret ingredient of a tiramisu and no part is wasted. Egg yolks are usually whisked with sugar and added to the mascarpone, to which stiff, beaten egg whites are then added for extra structure. As always, when using raw eggs in a recipe, go for the freshest eggs you can find—this usually means the farmers’ market, or, I envy you, your own chicken coop. If you live in the US, you can find pasteurized eggs which are believed to pose less chance of carrying salmonella. If you would prefer to heat treat the eggs, in some tiramisu recipes, whole eggs are whisked with sugar over a double boiler as if to make a zabaglione (a frothy Italian egg custard) and then transferred to a stand mixer to be heavily beaten with mascarpone. How to make a tiramisu without eggs? I know this is the real question on your mind. Yes, you can indeed make a tiramisu without eggs, though it won’t be quite as light or fluffy. Simply replace each egg white specified in the recipe with a ½ cup of heavy whipping cream. Leave out the egg yolk step, whip the cream with the sugar, and fold into the mascarpone as you would the egg whites. A dusting of bitter cocoa powder and/or shaved dark chocolate on top of the tiramisu rounds off the work begun by the espresso. If you can’t choose, use both! Since it’s already such a rich dessert, be careful not to over-sweeten your tiramisu as it will end up cloying. A small amount of fine caster sugar or icing sugar should be beaten into the cream. You can also add sugar to the espresso mixture, but as the ladyfingers come with their own dusting of sugar I find it’s not necessary, especially if you also plan on using a sweetened liqueur. How long do I need to wait before serving? To make sure you have an evenly flavored tiramisu and mascarpone that is cold enough to slice, be sure to chill your tiramisu for at least 2 hours before serving. How long is it safe to keep tiramisu for? According to the USDA, dishes made with raw egg are safe to eat within 3 – 4 days if kept refrigerated. If your dish is made without eggs you may keep it longer, though cream tends to absorb the atmospheric flavor of your fridge if kept too long and your tiramisu will start to become soggy. Single serve tiramisu, or, ‘tiramisini’, as Nigella Lawson would call them, let you put your fancy glasses to use (though tumblers will do just fine) for a more frou frou dinner party number—yes, I’m continuing to channel my inner Nigella here. The smaller portion sizes and deconstructed form mean that it’s easier to get a spongy dessert. It also saves you the trouble of wobbling slices onto plates. You can be creative while staying on theme by adding other Italian cookies to the mix. 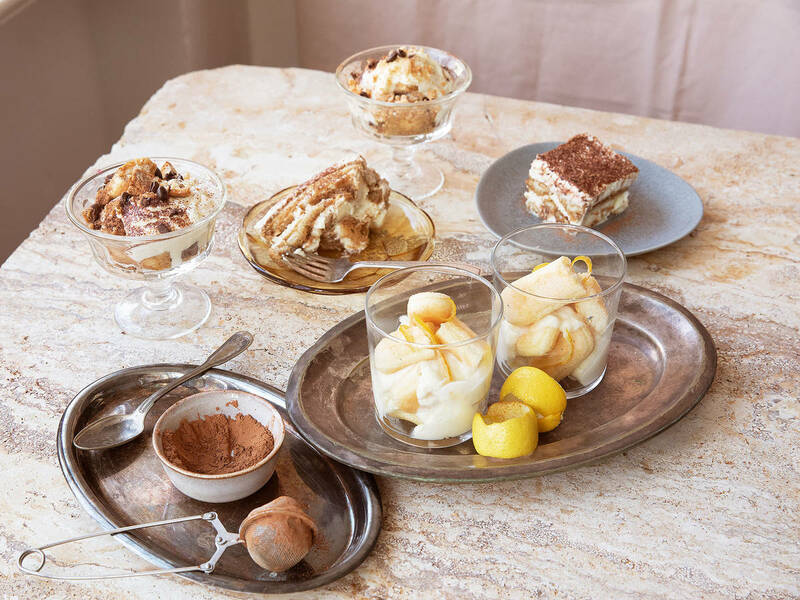 A crumbling of amaretti or biscotti—particularly to the individual, glass-sized tiramisu—would serve you well. Other garnishes could be a scattering of roasted coffee beans for extra bite, crushed nuts (almonds or hazelnuts would be the obvious contenders, though good quality pistachios could also vie for a place), or even nutty shards of brittle for a sweet crunch. Variations on a tiramisu quickly veer towards parfait or trifle territory—but I will make just this one concession for the aforementioned Italian chef Gennaro Contaldo. This zesty version does without the coffee, and instead the ladyfingers are dunked in homemade lemon syrup. Alcohol still features, however, with the classic Italian digestive, limoncello, whipped through the cream. Make it in a dish or in individual portions. Gennaro also makes another limoncello variation that includes both coffee and limoncello. Since tiramisu is a no-bake dessert, you can double (or triple) a recipe without hesitation—as long as your tray can hold it. I’ve made giant portions for birthday parties complete with candles on top and let everyone tuck in with a spoon, no plates necessary.